"One thing I've missed in the years of my being vegetarian is the delicious tortilla soup a local Mexican restaurant makes. I've finally mastered my vegetarian version, that can easily be vegan if the cheese isn't added at the end. My omnivore boyfriend thinks it's divine! Black beans can be added for extra protein." Arrange tortilla strips on a baking sheet and lightly with cooking spray. Bake in the preheated oven until golden and crispy, 8 to 10 minutes. Heat peanut oil in a stockpot over medium-high heat; saute onion, red bell pepper, and garlic until onion is translucent, 5 to 10 minutes. Add tomatoes with juice, zucchini, corn, and mushrooms; saute until zucchini is slightly softened, 3 to 4 minutes. Mix vegetable broth, chili powder, hot sauce, salt, and pepper into vegetable mixture; bring to a boil. Reduce heat and simmer soup until vegetables are tender, 20 to 25 minutes. Stir cilantro into soup and remove stockpot from heat. Ladle soup into serving bowls; top with tortilla strips, avocado slices, and Monterey Jack cheese. Corn tortillas can be used in place of flour if desired. I loved this recipe, thank you for sharing it! I garnished with avocado slices and a little queso fresco...delicious! It's a keeper! 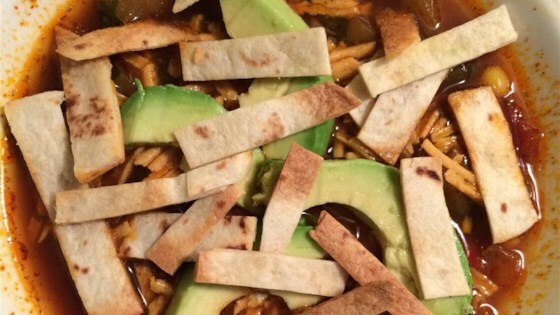 Great vegetarian option for chicken tortilla soup! Love the addition of the hot sauce. I added a little bit of fresh squeezed lime juice. Quick and delicious! This is a really flavorful soup. I actually made it with chicken broth and canned corn. Light , meatless and delicious. I'll definitely make it again! Amazing soup! I've wanted something Mexican inspired with a bit of heat and hearty. This did the trick. The best part is that you can spice it up if it is to bland for your liking. Quick tasty soup. I am not a hot sauce fan so I omitted it and put in some extra chili powder instead. The result was mild but not bland--just what I wanted. I'll definitely be making it again!